Those who know Joel-Peter Witkin's work wait years for a new book of his photographs. 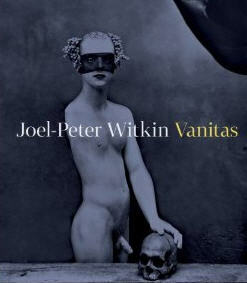 His new book Joel-Peter Witkin: Vanitas is just about to come out from Arbor Vitae publishers on August 31, 2012. Witkin is a Brooklyn born photographers who stylized black and white portraits focus on still-life and portraiture and stirs up controversy whenever they are shown. Witkin's black-and-white portraits and still-lifes of hermaphrodites, body parts, severed heads, and mutilations and religious thmese are the subjects and objects Witkin presents to us. For Witkin, the goal is simple: "I wanted my photographs to be as powerful as the last thing a person sees or remembers before death." Morbid to some maybe, but he photographs his subjects beautifully creating an atmosphere of decadence. His influences come from his appreciation of Goya, Odilon Redon Hieronymus Bosch, and Giotto. This book is a survey of his work from the 1970s to present day and presents a collection of Witkin’s latest photographs, his retablos, created over the last three years.